Let’s make one thing clear: it never rains in southern California. But oh, when it rains, it pours. And for the record I absolutely detest the rain, not so much because it makes everything wet and gloomy but more prominently because I lack the proper footwear for such weather. You see, because it never rains in California I cannot justify the purchase of a pair of Hunters or Wellingtons that will rarely see the light of day. Instead I’m left to fend for myself and hop over puddles in leather boots that inevitably get ruined but are the only shoes I own that could possibly withstand the rain. Perhaps someone out there (there being the J. 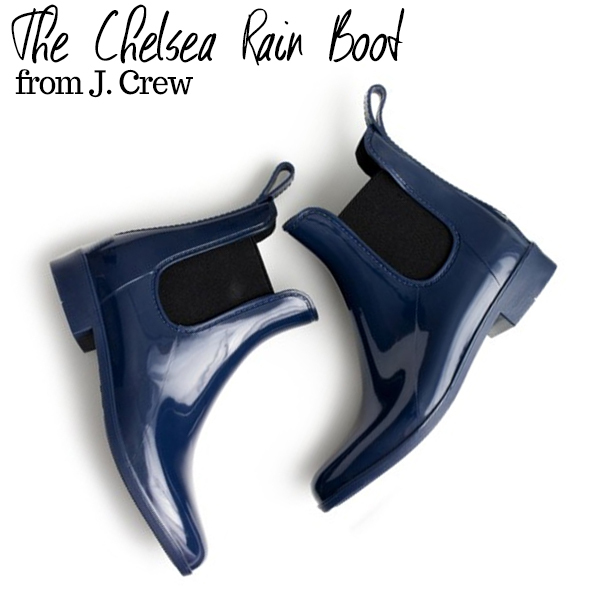 Crew design studio, naturally) has heard my desperate pleas for a shoe that is suitable for the rain but can maybe be worn even when the weather is lovely, because J. Crew has just unveiled a slew of rain boots that I could totally justify purchasing. The concept is simple: take the ever stylish Chelsea boot shape and do it up in water-resistant rubber. Color it in classic shades (navy, olive, and black) and maybe throw in a pair of leopard-print boots just for kicks (haha, get it, cause they’re shoes), and let the shoppers go wild. Don’t get me wrong, I think Hunters are chic but they are so obviously rain boots. With these boots, you can wear them in the rain and look more adorable than any other sad sap with an umbrella, but you can also wear them just walking around town and most people will probably assume they are just great patent leather Chelsea boots. We won’t tell! Would you wear these chic rain boots out and about? I literally gasped when I saw these. So cute! !